In what should serve as a warning to all men, Chris Brown reveals that woman-beating will always come back to haunt you. The has-been singer has been trying to reform his image since the infamous Rihanna attack in February 2009. 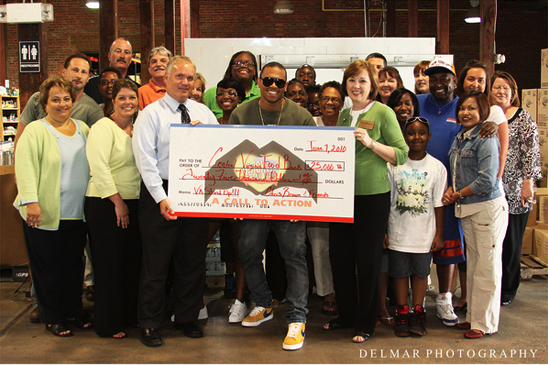 Most recently, he upped his CSR initiatives by donating two giant cheques to two charities. 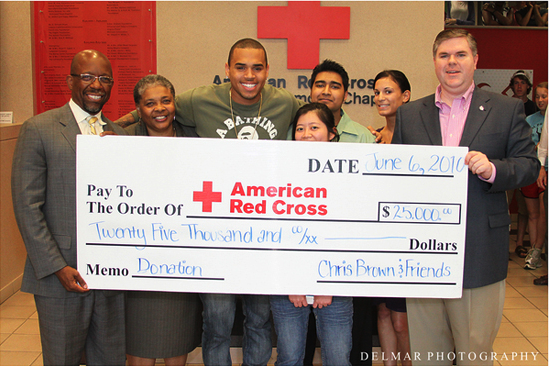 Brown not-so-humbly tweeted these pictures of himself handing over the $50,000 (combined) cheques to the American Red Cross and the Central Virginia Food Bank earlier this week. While some people may have been impressed with his efforts to give back, the UK clearly saw right through it. A few days after the donations, Brown was denied entry into the UK, which seriously impacted the success of his tour. While his publicist claimed the rejection was based on "issues surrounding his work visa," Britain's Home Office countered that they "reserve the right to refuse entry to the UK to anyone guilty of a serious criminal offense." My take: Chris Brown's past will always haunt him. While the public is generally very forgiving of celebrities, Brown didn't put in his time and hadn't yet won the public's heart. While songs like "Forever" and "With You" will always be favorites, I will never see past Rihanna's battered face. Chris - it's time to pick a new career path. What do you think?